Today's card is another super simple one. I used some pattern paper that can be purchased through the Silhouette Store with some adorable little whales! I simply could not resist. I used the Sail Away stamp set with some pail tomato ink so that the card wasn't so dark with black, grey and blue. Hope that you guys have enjoyed this release! Be sure to check out the other creations by the design team by clicking on their name in the right sidebar. I'll be missing for a little while as I get our home moved and get everything back in order. Hello Everyone! Hope you guys have been having a great start to your week. We are up to our ears in boxes here at our house. But all in crazy fun! Its time for Scrappy Moms Terrific Tuesday Challenge. If you haven't joined in before, please join in on the fun!! TTC, as we call it for short, happens on the first and third Tuesday of every month. 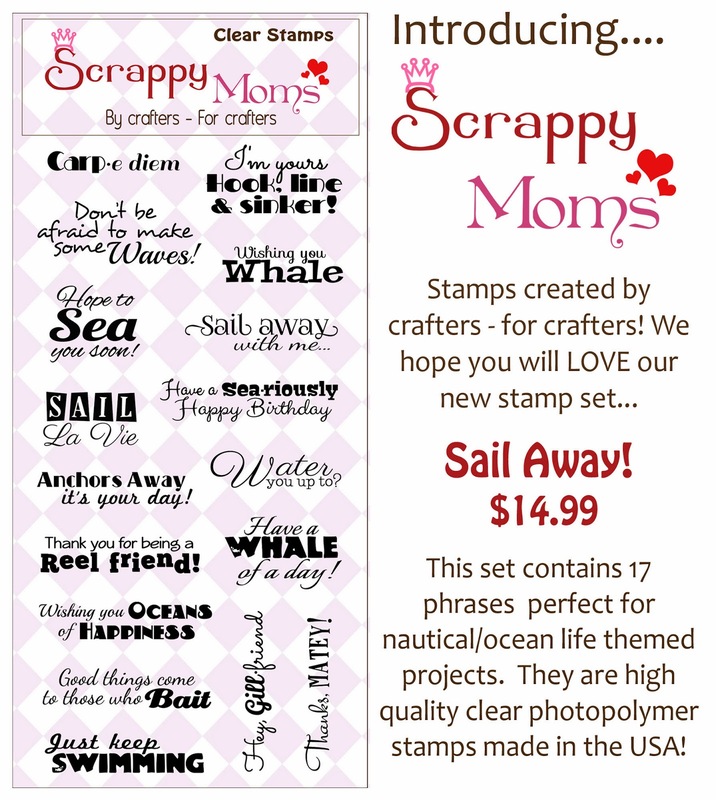 Be sure to check out the Scrappy Moms Blog to see the design teams fabulous projects for this challenge and to enter in the challenge for your chance to win a Scrappy Moms stamp set of your choice! 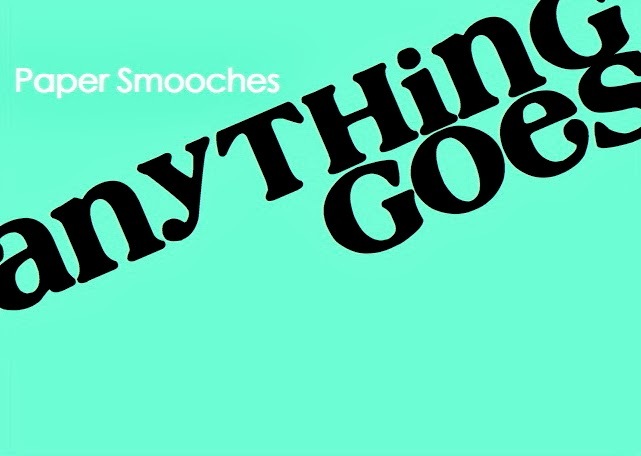 This weeks theme is "Things that go"! When I saw the Ready, Set, Go! stamp set, there was on stamp set that screamed Baby theme to me "Oh, the places you will go". I thought maybe it would be fitting for welcoming a newborn or perhaps for a 1st birthday. Here's the card I created for TTC and my day #2 card for the February release. The train is a cut file from the Silhouette store. I used glossy accents and my wink of stella to add a little shine to the train parts and hearts that I used as the steam. Hope you guys enjoyed this card! Be sure to check out the other designers great projects. Hello Everyone and Happy Sunday! Welcome to Week #3 for February for Paper Smooches SPARKS Challenge! So the first thing I did was open my ink drawer and I remembered that I had recently received my order with some fantastic new ink colors! I was bummed looking at these pictures because it doesn't show how incredibly vibrant the colors are on this card...I blame it on poor lighting! This card needed a little something else so I tied some twine I had laying around and used the little tag from the Crystal Clear set with a heart from the scripty sayings stamp set. And that's it! I hope you guys enjoyed this card. Be sure to check out the other great designs by the design team over on the Paper Smooches SPARKS Challenge Blog! And join in on the fun for your chance to win store credit toward your next Paper Smooches order! I decided I wanted to make this card a wee bit tinier than I normally make, so this one measure 3.5" x 4.5". The car is from the Paper Smooches "My Guy" stamp set colored with my Copics. I added some detailing with a white gel pen and some glossy accents. Be sure to check out the other designers absolutely fantastic projects by clicking on their name in the right side bar. And I'll be sure to see you back here soon for some more projects for the release. I'm here with another project for the Paper Smooches SPARKS Challenge. This week is a Picture Perfect Challenge, where we draw inspiration for a photo. The next 2 photos show the true color of the purple card stock that I used. This card is pretty easy to assemble once you get going. I first stamped the hearts from Sweet Hearts with Versamark ink onto my large heart die cut and used gold embossing powder. Once I had melted the gold embossing powder, I started to stamp the hearts in the light pink and raspberry ink (Hero Arts Shadow Inks in Pale Tomato and Raspberry Jam). I don't have any banner dies in my collection of crafty things, so I decided to create one. I simply cut a V into the right side of the sentiment. On the left side I made 2 score marks approximately 1/4" apart, add some foam adhesive, then fold them in opposite directions and you have a little floating banner. Easy Peasy! Hope you guys enjoyed this card! 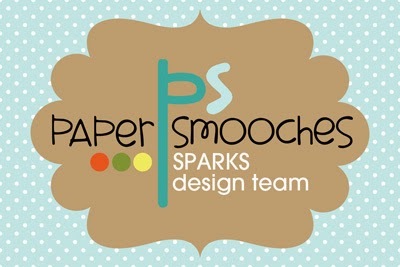 Be sure to head over to the Paper Smooches SPARKS Challenge Blog to see the super talented design team projects and to enter in on the fun of the challenge for your chance to win Store Credit toward your next Paper Smooches Order!! Hello Everyone! Hope your start of the week is going great....cannot believe that we are already in February! Time is just flying by! Its time for Scrappy Moms Terrific Tuesday Challenge. If you haven't joined us before, join in on the fun!! TTC, as we call it for short, happens on the first and third Tuesday of every month. 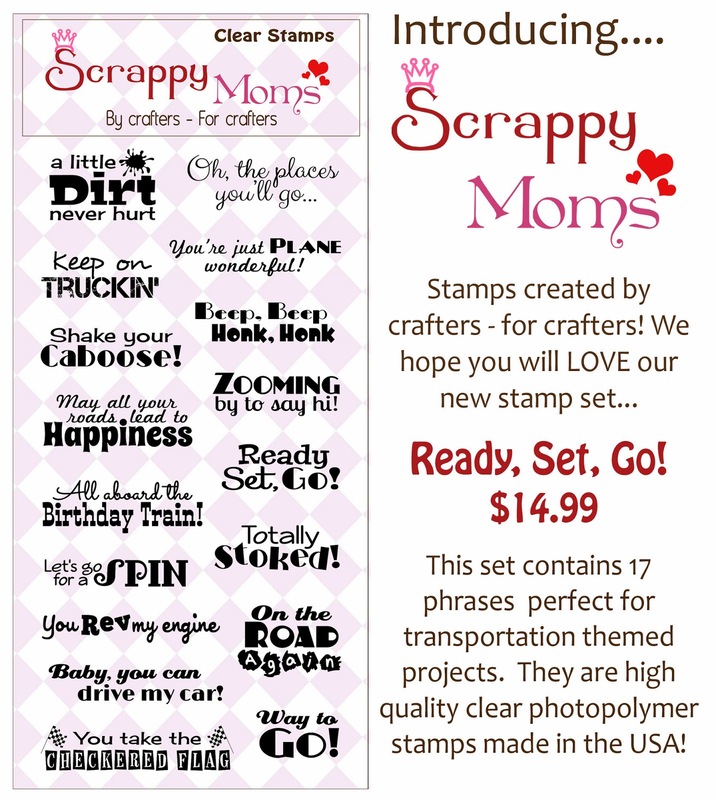 Be sure to check out the Scrappy Moms Blog to see the design teams fabulous projects for this challenge and to enter in the challenge for your chance to win a Scrappy Moms stamp set of your choice! For this weeks challenge, we are preparing for the upcoming holiday of Valentine's Day. 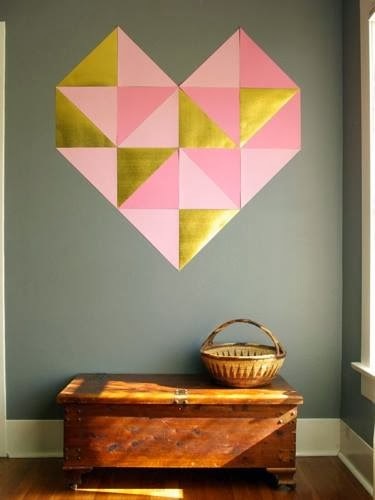 You simply need to create a project having to do with Valentine's Day to enter in on the challenge! I decided I wanted to create a somewhat 1 layer card (except for the sentiment). So I masked off an area to stamp this adorable little boy from The Greeting Farm OA- Valentine stamp set. I then used Paper Smooches Sweet Hearts stamp set to create this heart filled background with some Hero Arts Shadow Inks (in pale tomato, red royal, and raspberry jam). Colored 'Oliver' with my copics and added some Wink of Stella on the heart. To define the space a bit more, I used Faber-Castell Artist Pen in the Small Tip and created some faux stitching. 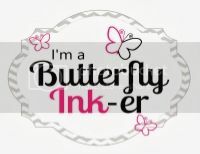 My sentiment is from the very appropriate for valentine's day stamp set titled "Crazy 4 You" from Scrappy Moms. ((love this stamp set!)) I then tied it all together with some twine and that completes my card! Hope you guys enjoyed this card and will join in on the challenge!